Isabella Sade, the 2017 Summit League Freshman of the Year, celebrates during the 2017 Omaha Challenge. Photo courtesy University Communications. It is no surprise that people are calling the new volleyball squad the “New Herd” of Omaha. With 11 newcomers to the team, the new Mavs are full of energy on and off the court. The Mavericks bring enormous amounts of energy and competitiveness to practices as well as competitions. When the volleyball season kicked off, the start of the season wasn’t exactly what the Mavericks wanted. The season opener was the New Orleans Invitational tournament, where the Mavericks fell short in all three of their matchups. Coach Shires described the girls’ playing that week as “passive” and “scared–”and it wasn’t the way they had been training. During the invitational, the Mavericks faced off against the New Orleans Privateers, The Murray State Racers, and the Houston Cougars. The Mavericks lost 3-1 against the Privateers, lost 3-0 against the Racers and lost 0-3 against the Houston Cougars. The team’s hard work finally paid off when the Mavericks won their first tournament at the Omaha invitational. In fact, it wasn’t just a win – it was a sweep as Omaha went 3-0. The public caught a glimpse of what the new herd was capable of. The Mavericks faced off against the UTEP Miners, the UMKC Kangaroos and the UIC Flames. Mavericks won 3-1 in both matches against UMKC and UIC. The Mavericks swept the match 3-0 against the UTEP Miners. In addition, the squad competed in the K-State Invitational and the CEFCU Classic, going 2-4 combined in those tournaments. Isabella Sade has been another powerful player for the Mavs, having recorded over 116 kills and 41 block assists. Sade and Blaschko have been a great block duo for the Mavericks this year. “It takes a lot of practice and focus, as well as communication,” said Blaschko. Sade made the All-Tournament Teams at the K-State Invitational, the Omaha Challenge, and the New Orleans Invitational, along with winning Summit League Freshman of the Year honors in 2017. Earlier this year, Shires said that Sadie Limback was one athlete to keep an eye on, and the freshman is already making waves: Limback has recorded 121 kills averaging 2.8 kills per set. Limback has also been a top blocker with having 32 block assists this season. The team will now enter into conference play and will return home on Sept. 28th for the first time since the Omaha Classic. After away trips to both South Dakota State and North Dakota State, Omaha will play Western Illinois on Sept. 28th, Purdue Fort Wayne on Sept. 30th and will finish its homestand against Summit League newcomer North Dakota on Oct. 5th. 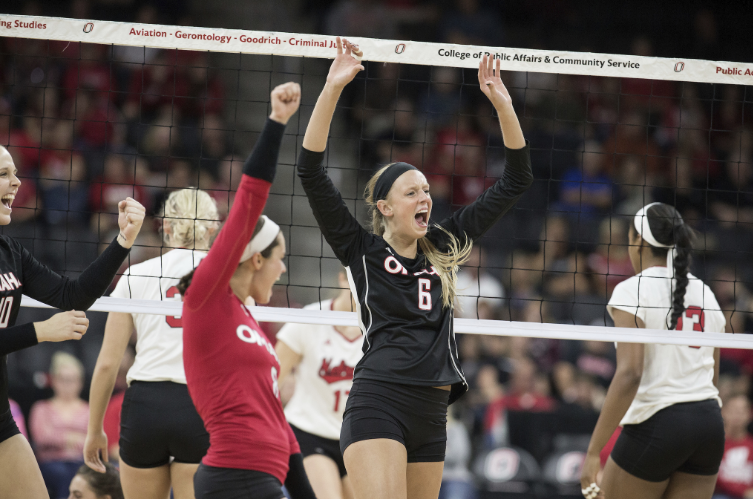 Since the publication of this article, Omaha won its conference-opening match against the South Dakota State Jackrabbits 3-1. All records and statistics in this article do not reflect the match played on Sept. 21st.